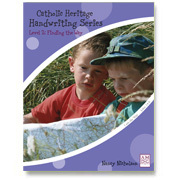 Catholic Heritage Handwriting, Level 2 manuscript practice is a perfect fit for children making their First Holy Communion. Top spiral bound, single sided pages. 74 pgs, 36 weeks.